A mix of African Corn Lilies with graceful and attractive star-shaped flowers in June and July. Plants have grass-like leaves, grow to a height of 35-50cm and hold their flower spikes on wiry stems. They grow well in borders and containers. Ixias like full sun and well drained soil. Plants grow during the winter and spring, flower in early summer and then become dormant later in summer, when they need to dry out. Plants need protection against hard frosts during the winter, with a good mulch, or keep in pots and overwinter in a greenhouse. Plants sometimes need staking in exposed gardens or when growing in part shade. 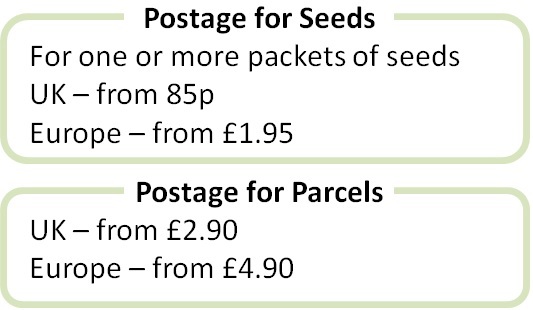 Pack of 50 seeds. Sow in autumn or spring. Sowing instructions and a colour photo are printed on the packet. Sow spring or autumn in a deep seed tray or pots of well drained seed compost. Cover seeds lightly with compost. Keep at 15 - 20°C during the day and 10-15°C at night and germination takes 3-4 weeks (sometimes longer, up to two months or more). Although nearly hardy, best to protect this winter growing plant from hard frosts, lower than -5°C. Let the corms dry out during the summer, when the plant is dormant. This is a good pot plant, to be kept over winter in a greenhouse. Grow Plants grow in the winter and spring, flower in early summer and the leaves die down after flowering, when the corms should be allowed to dry out. Corms can be removed in summer and replanted about 10cm deep in the autumn, either directly in the soil in warmer climates or in pots (and protected from frosts) in colder areas. Plants spread naturally in good conditions. 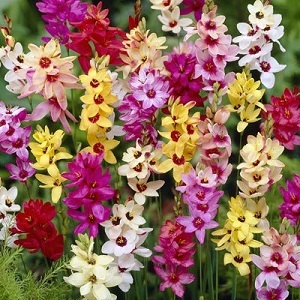 The corms of mature plants produce offsets – the offsets can be removed in summer after flowering and grown on into new plants.